Sport Court’s indoor modular flooring systems deliver excellent traction and shock absorption for volleyball, basketball, soccer/futsal and a wide variety of other activities and events in high school, middle school, and elementary school gymnasiums and multi-purpose rooms. For nearly two decades, Response has been the choice of both NCAA and USA Volleyball, with nearly every championship from the Juniors to the Olympics being contested on this surface. 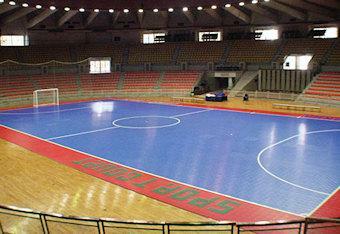 Response was also recently chosen as an official futsal surface by the US Soccer Foundation. Response provides superior performance, traction, and shock absorption and is suitable for nearly any sport at any level. The official court surface of the 2008 NCAA Men’s collegiate volleyball Championship, Women’s Division I Championship and USA Volleyball. 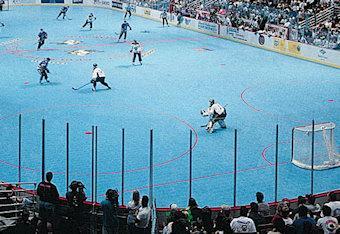 Originally developed for the roller hockey industry, Defense is a proven performer for all kinds of activity. 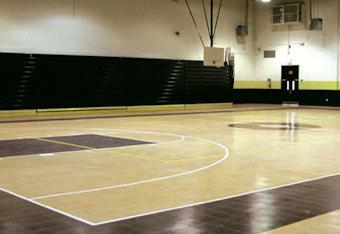 Its low cost makes it an excellent surface for elementary and middle school gyms and activity centers. The wide range of color options make it possible to customize any space for everything from four-square and dodgeball to basketball and volleyball. This attractive surface improves upon our traditional Response modular surfaces by adding a hard-as-nails coat of urethane, giving your gym a glossy, durable surface that repels surface blemishes and improves cleanability. The wood-look finish is based on traditional maple hardwood flooring, lending a polished and professional look for high-level competition in any space.